It has been a while, but I'm back! And, I what better way to come back than a Thriving Thursday to showcase one of my favorite books! 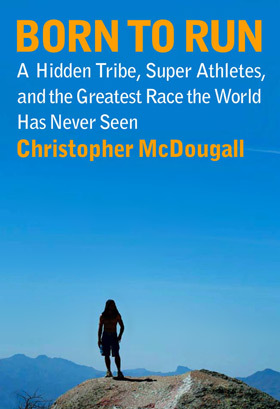 A little over a year and a half ago, my brother introduced me to the book Born to Run, by Christopher McDougall. It is a book that has changed my perception of running forever - for the better. I thought this would be an appropriate book for a Thriving Thursday entry, because running can be enjoyable. Maybe with a little history behind it? Maybe with some really cool inspiring stories? I didn't always like running as a kid. Growing up, I joined my high school's track team to see if it would help with my affinity for the sport. It didn't... Then, when I started running [to lose weight and log it in as my cardio], I thought I had "loved" it, but I was wrong. I only really LOVED it after reading this book! It's the author's personal journey of finding out that we were all born to run. For me, I am always hesitant about starting a book, unless it comes highly recommended. So, to my brother, that should say something! Anyhow, the read started out slow, as I have "selective" memory, and I flipped back and forth to make sure I was referencing the right people. (Have you ever done that? I hope I'm not alone!) After the first couple of chapters, I was sucked in. I was taken along for a ride of discovery and elation, and finished the book inspired about what my body's abilities are. One of the many things I learned from this book is that, even though we were born to run, it takes training and practice to perfect. Such with any other sport or activity. Since reading, I conquer longer runs tirelessly, and without listening to music. When I run, it feels liberating and empowers the connection to my inner strength. For me, there is no better feeling than that! (Ok, maybe I can name a couple others, but we'll keep this entry G-Rated!) It also delights me to see other runners engage in the same [running] technique. There are times, when I just want to take off running with them! If you have read this book, I would love to hear your thoughts or stories. And, if you haven't, I definitely recommend it! I hope others find the same encouragement for a healthy lifestyle in this book. It'll be a book I reference for years to come. The next book on my list is Power Foods for the Brain by Neal D. Barnard, MD. I caught the end of his special featured on PBS, and it intrigued me tremendously! Live well, eat well, treat each other well, and THRIVE ON!